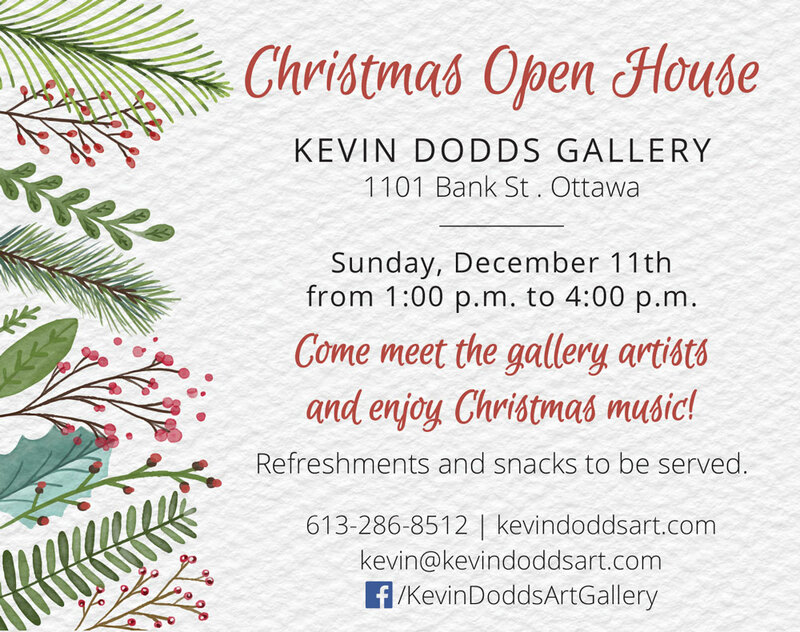 This beautiful, cozy gallery features Kevin Dodds artwork, but will soon expand to display work by some of the artists Kevin represented in Ottawa. 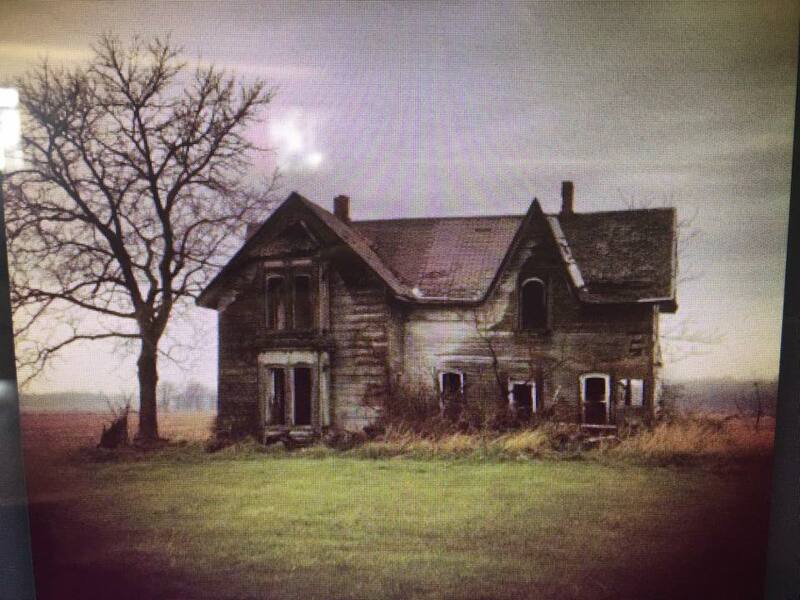 Kevin is currently offering classes and workshops in this venue. Everyone is invited to this great free event! 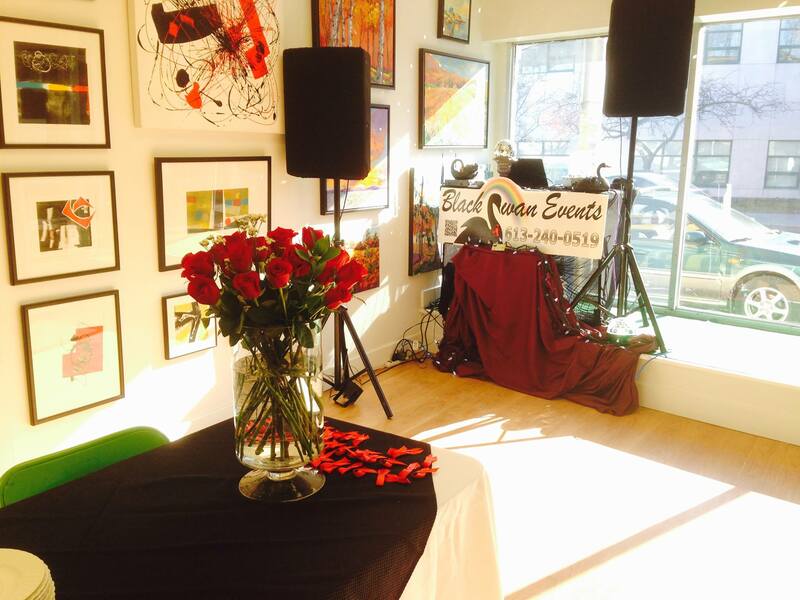 It is our 1st Open House in 5 years. 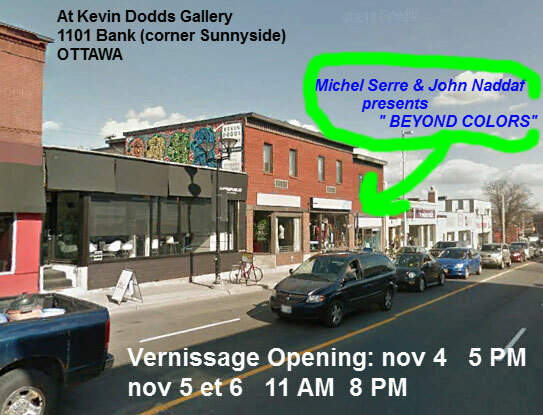 Location: At Kevin Dodds Gallery 47 John St N Arnprior 613-286-8512 . Description: Learn how to paint feathers and branches with red berries and snow. It’s not difficult! 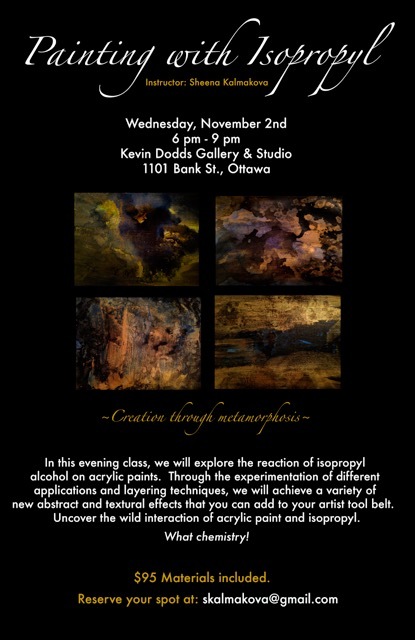 Registration: Call Kevin 613-286-8512. Spaces available if you call now. 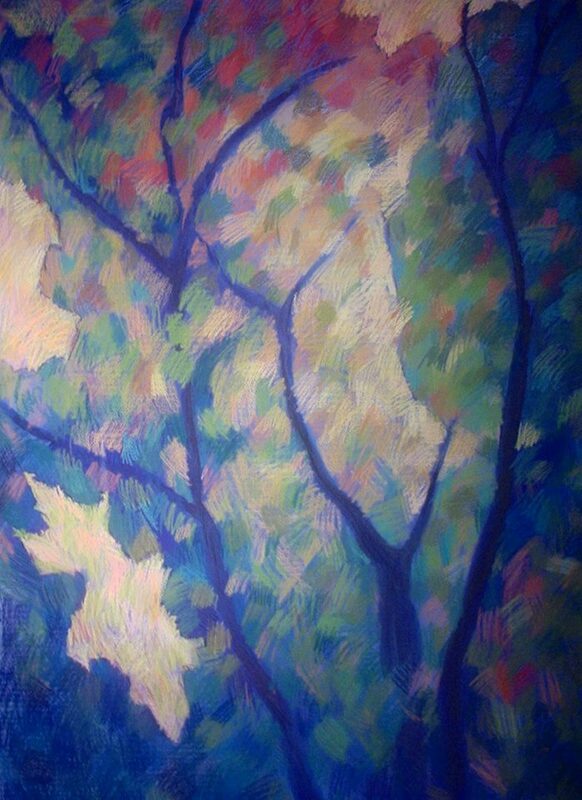 We will be painting this vibrant fall scene using acrylic paint and gloss gel medium. Everyone will follow me as I paint in front of the class. 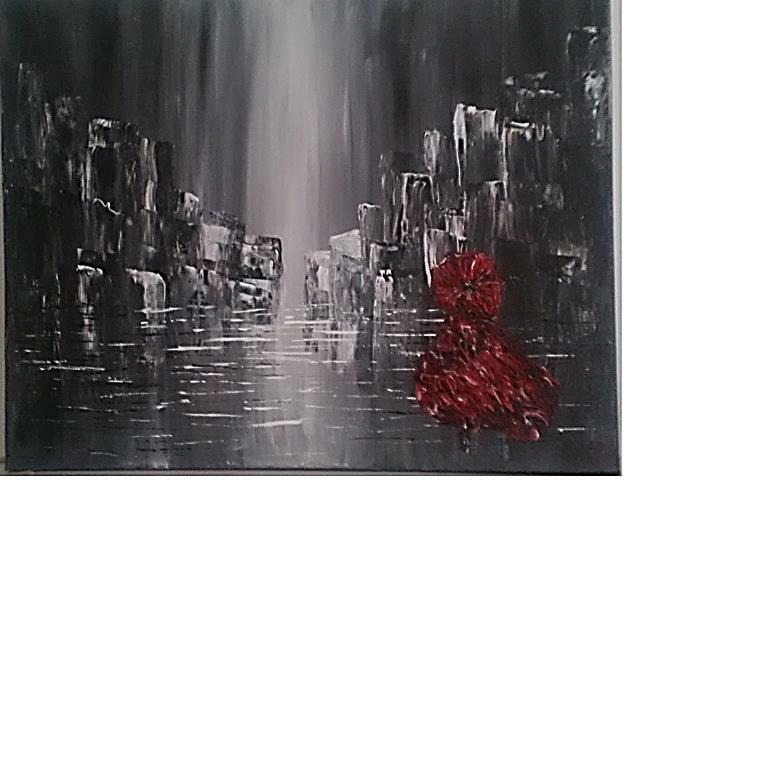 We will look at using a larger amount of acrylic paints to create a beautiful textured painting , cost is 100.00 plus HST. 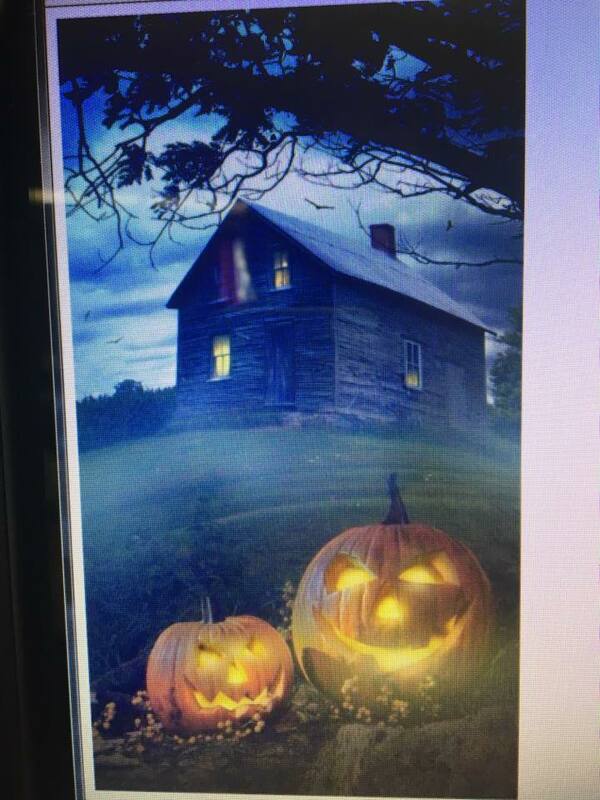 Description: Painting a scary halloween landscape with an old abandoned house in oils. See examples below. We will explore different options in class to enhance the eerie mood of the painting: adding a full moon in the sky or a glowing light in some of the windows. 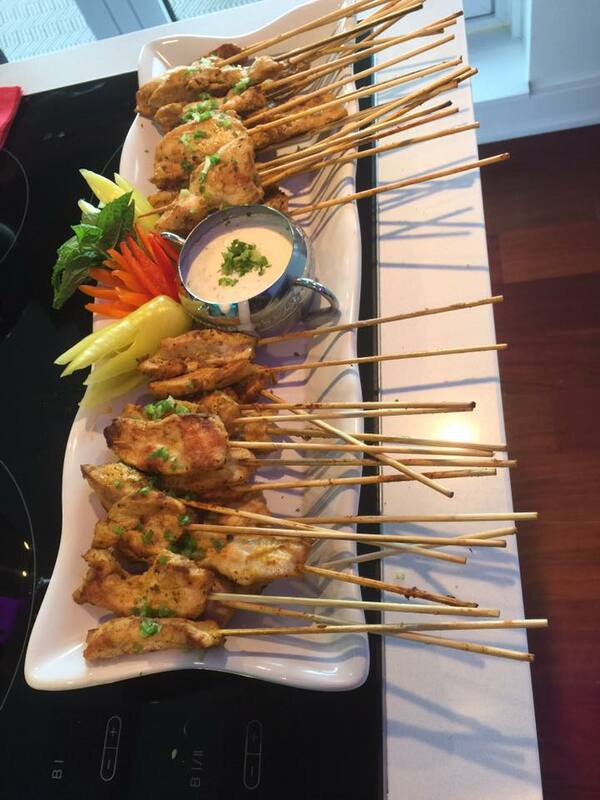 The individual participants will be able to modify the painting according to their taste. – Pouring medium: Create some really neat artwork! Learn to paint a beautiful landscape that includes a building using both brushwork and palette knife work. Cost: $110 includes all material. Bring your own brushes if you can. 25% proceeds go to Bruce House and Snowy Owl Foundation. Learn a faster way to paint a beautiful oil still life. 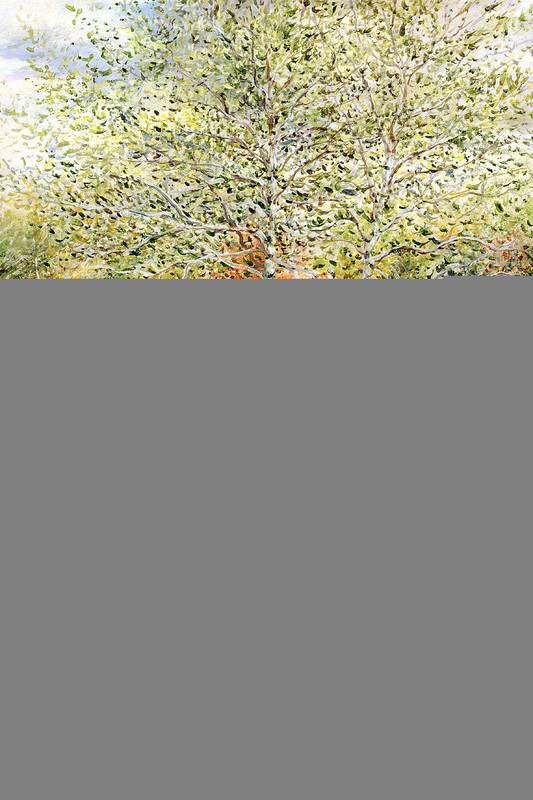 In this workshop, you will start with an acrylic underpainting and will finish with an oil layer. Today we are flooded with hundreds of alluring, exciting new colours that painters in previous eras could only dream about. With this abundance comes the paralyzing stress of too much choice. The paradox is that colour is the least important quality of the paint you use and if you are focusing on colour, your painting experience can become frustrating and stressful. In this 3-class course you’ll do a series of painting exercises and learn a process that will equip you to make good colour decisions as well as the daring and unexpected colour choices that can elevate your work. You will learn to assess the more important qualities of value, saturation, and temperature before finally making the colour choice. If you have studied other colour theory systems, you will find this process augments what you already know. Colour is a slippery character–the more angles of approach you have, the better. Included in this course is an exploration of colour psychology and communication. 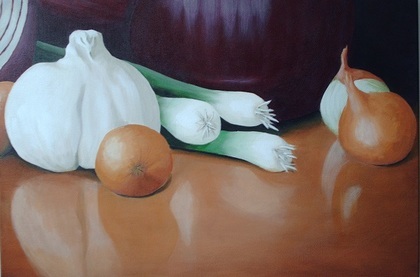 This course can be done using oils or acrylics, but acrylics are best for the technical range they allow. You will use the paints you already have. On registration a full list of materials will be available. Class size is limited to 6 registrants. Please contact June if you have questions. 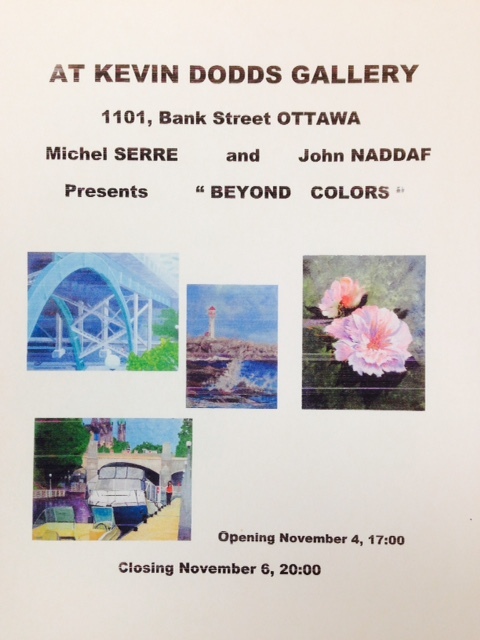 Location: Kevin Dodds Gallery, 1101 Bank St. 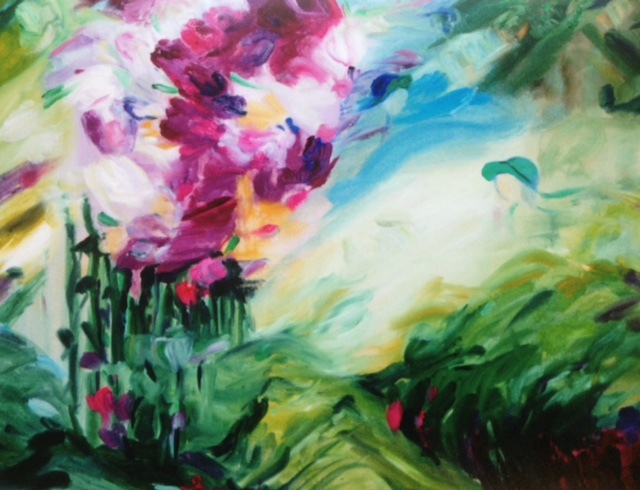 If you’ve always wanted to paint then this course is for you! You will learn about the wonderfully versatile acrylic paint, ‘tools of the trade’ and a variety of painting techniques. 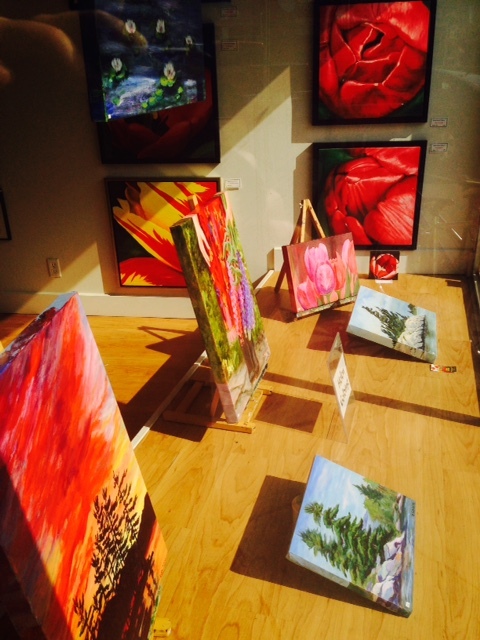 You will also learn how colour, value, composition and perspective can improve your paintings. 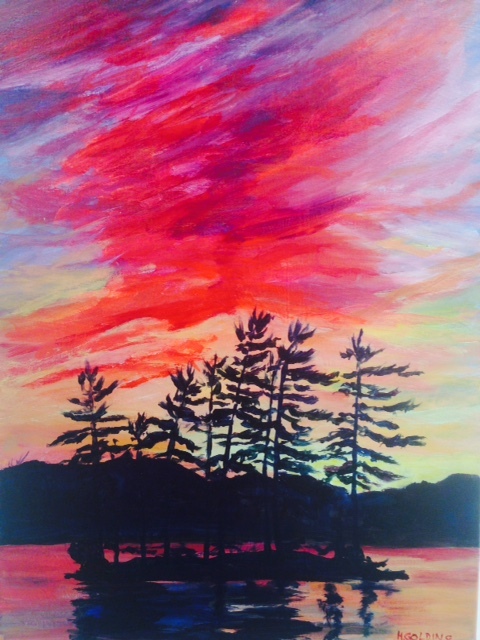 Each week will consist of a brief lesson and then students will work on their own paintings with individual help. At the end of the course students will be able to mix colours, apply glazes, understand values, foundation composition and perspective. They will be comfortable starting and completing a painting on their own, and will complete several during the program. A materials list will be provided at registration. 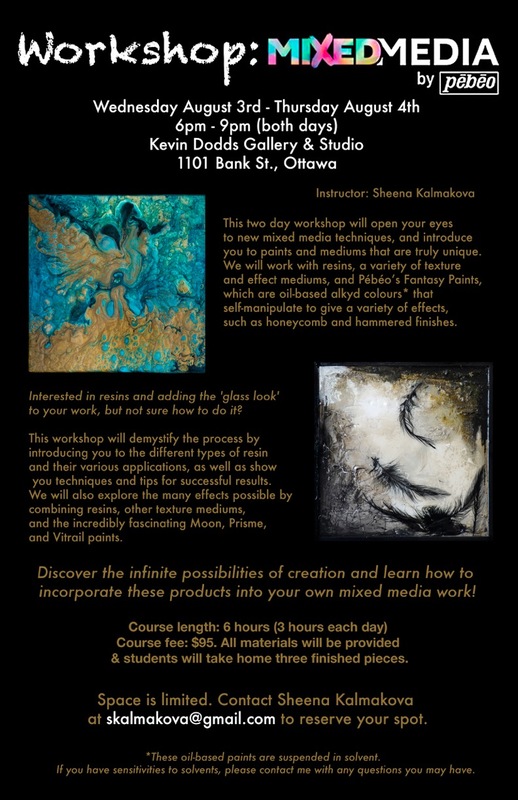 Four Exciting January Acrylic Workshop with Sheena Kalmakova. 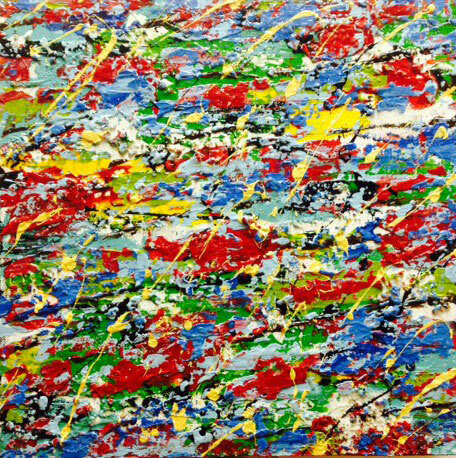 Learn to express yourself freely with impressionism using loose brush strokes and a ‘cacophony’ of colours. 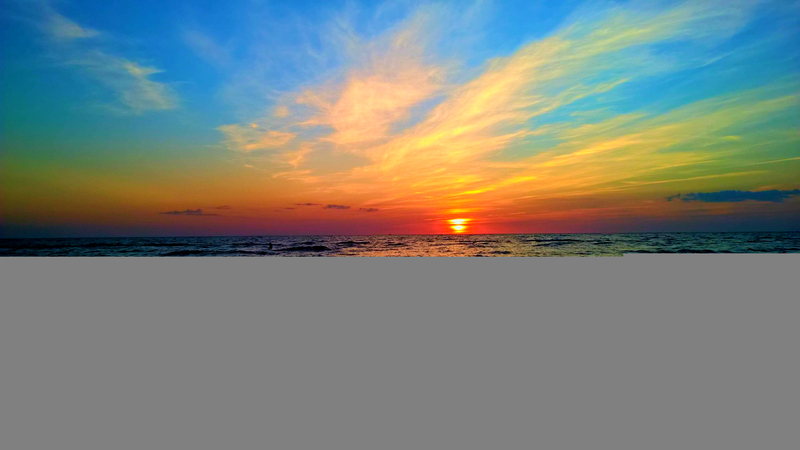 The above photo is for this post only since various photos are being considered as reference photos for the workshop. Register soon since space is limited. 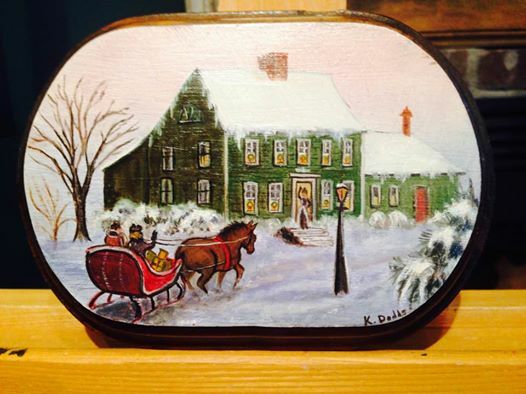 Paint a beautiful old-fashioned Christmas or winter scene on an antique board with internationally known artist Kevin Dodds. 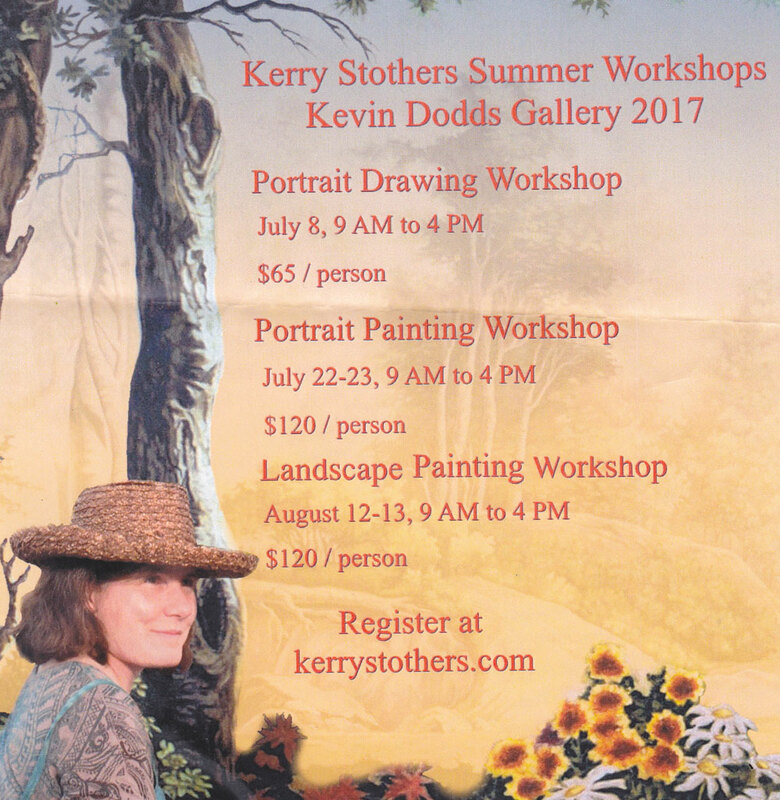 This class will give you the skills to paint in oils using smaller brushes to create detail in your paintings even if you are not a very experienced painter. You will have fun creating an old fashioned scene on a rustic board . We will use antique Christmas cards from the Victorian era as ideas for your painting. 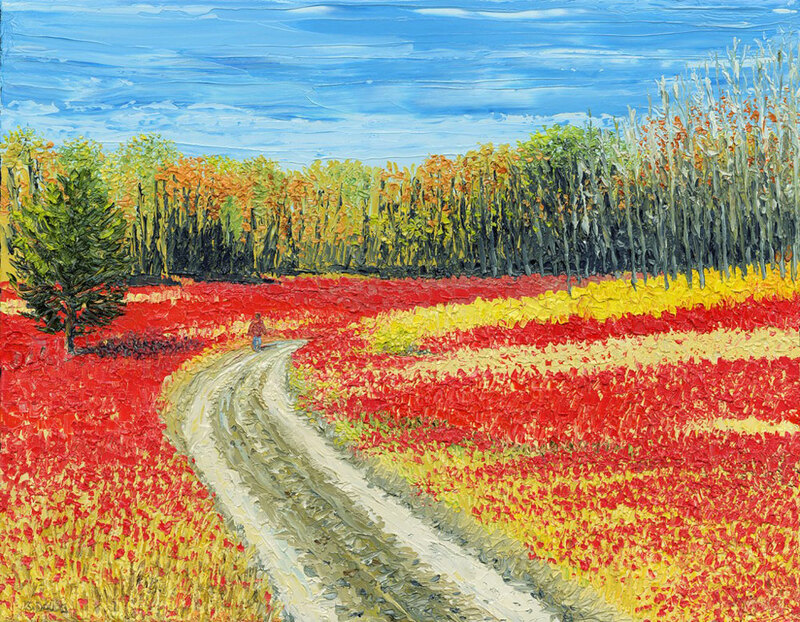 Paint the brilliant colors of autumn with acrylic paint using large and loose brush strokes. To register: contact Kevin at 613 -286-8512. 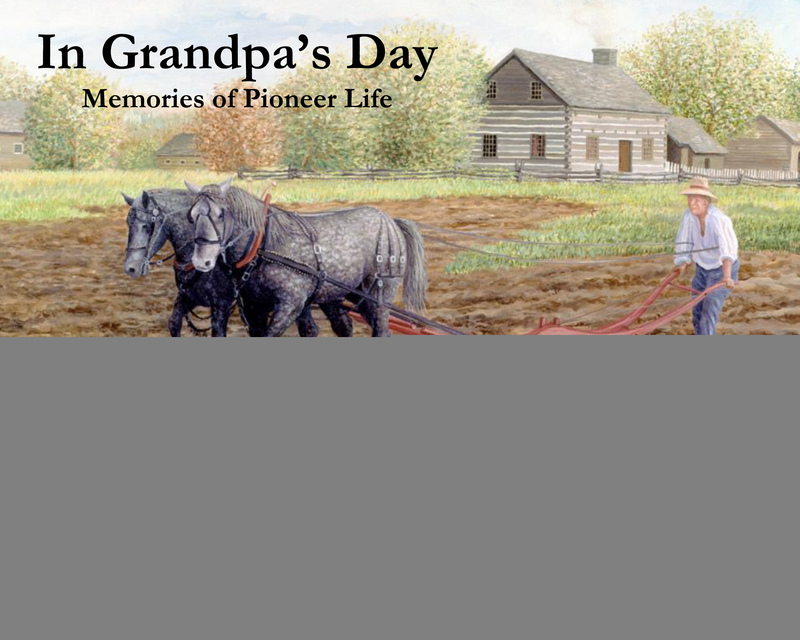 Kevin Dodds will be with author/publisher Roxanne McLaren of Another Chapter Publishing signing books “In Grandpa’s Day” and his new 2017 Lang Calendar!! Get your calendars before they sell out!! They will be located in the curling building at the back of the fairground. Call 613-286-8512 for more details. This is a fun Halloween-themed acrylic/mixed media workshop. Each participant will leave with his/her own masterpiece. For registration, phone Kevin at 613 -286-8512. 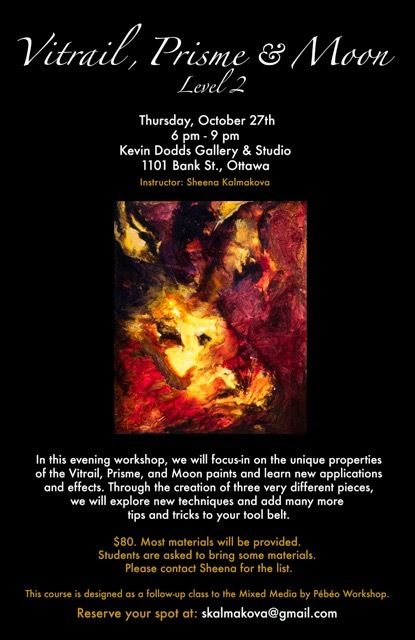 You are invited to a VERY special Fall “Charity Art Show” being held in the Kevin Dodds Gallery & Studio in Ottawa! Make sure you mark this date on your fall “Social Calendars”!!! 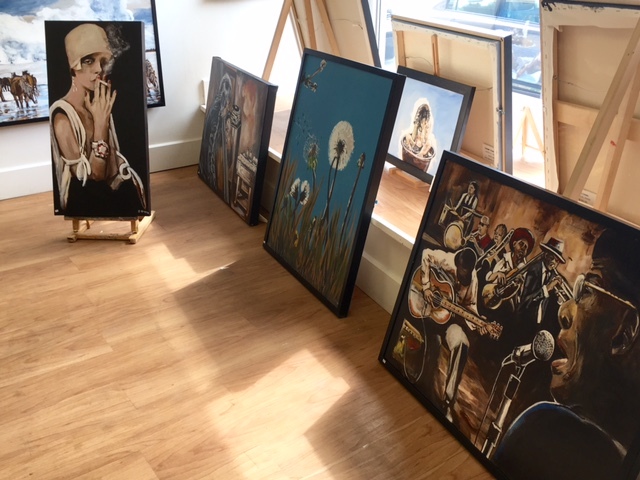 Please come out and support a GREAT CAUSE….the Bruyère Foundation and enjoy an leisurely afternoon of viewing gorgeous, original art, chatting with the artists and nibbling on fabulous food and sipping on refreshing cocktails! 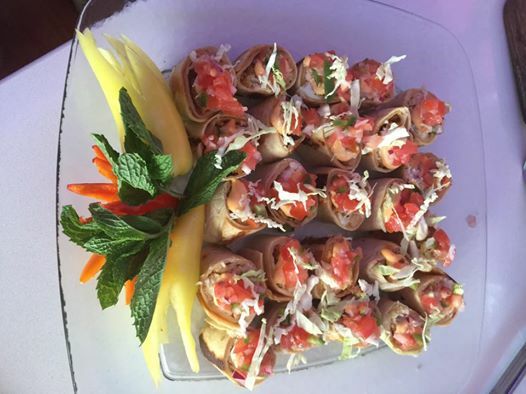 (All included in your $25.00 pp entry fee). 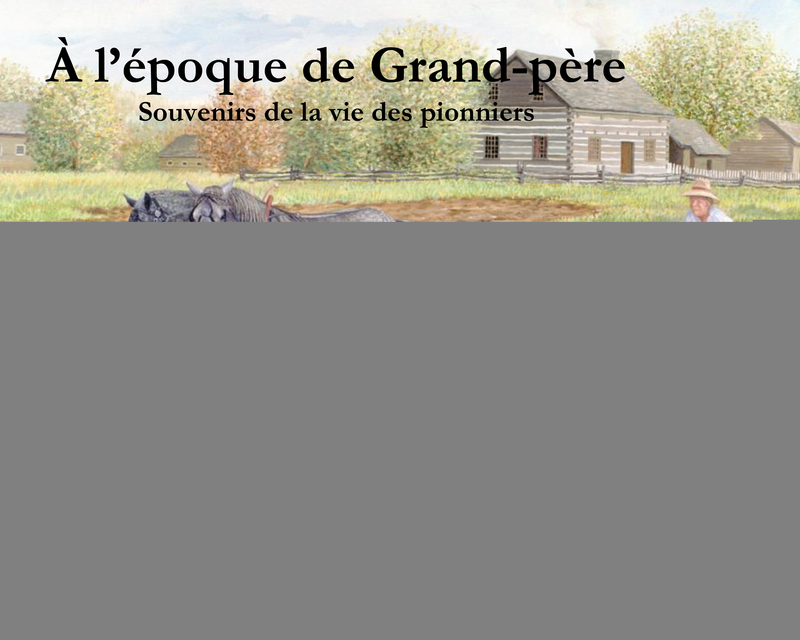 $25.00 Cdn per person entry fee (payable by cash or cheque at the door). 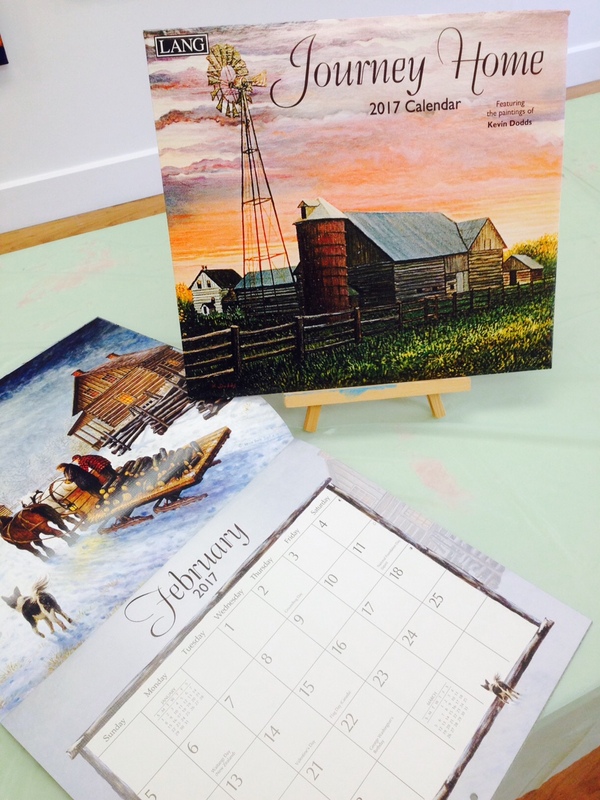 There will be FAB-U-LOUS door prizes at this event…..including a chance to win one of these beautiful new 2017 “Journey Home” Calendars by artist Kevin Dodds! 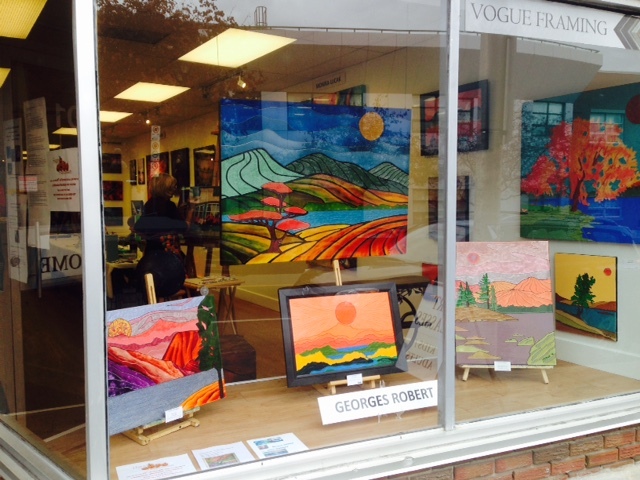 These will also be available for purchasing with partial proceeds going to the Bruyère Foundation in Ottawa, Canada! 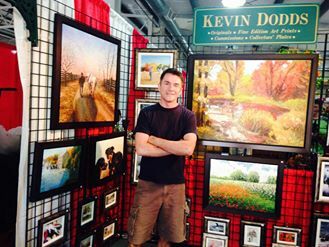 Have a more colourful and serene 2017 with Kevin Dodds’ 2017 Lang Calendar featuring some of his latest paintings. This beautiful calendar is currently available at the Kevin Dodds Gallery in Arnprior and at his Ottawa gallery at 1101 Bank St. near Sunnyside. The calendars is $24 and can be shipped to anywhere in Canda for $12 and to the USA for $18. 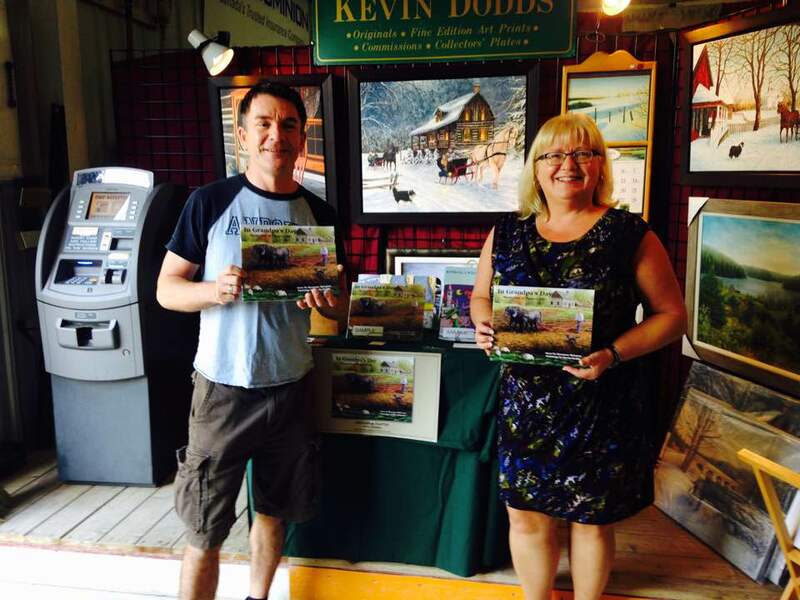 Kevin Dodds’ beautiful paintings depicting early life in Upper Canada, accompanied by Roxanne McLaren’s stories, create a special book about life in an earlier time. 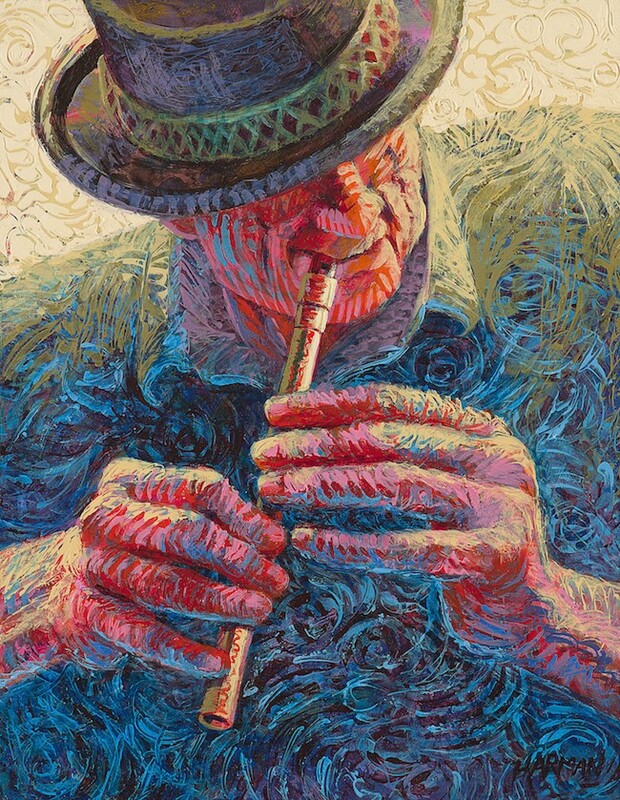 Les peintures de Kevin Dodds reflétant la vie dans le haut Canada, accompagnées par la charmante histoire de Roxanne McLaren, créent un livre spécial sur la vie du passé. 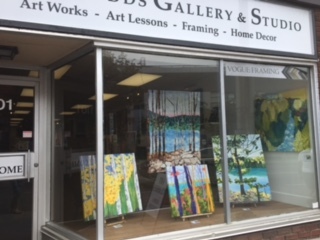 New Exhibition of Originals by Ottawa artists Deborah Clarke and Chris Howard until Sept 19th at Kevin Dodds Gallery 1101 Bank St Ottawa 613-695-6900, stop in and see this Dynamic Exhibition by two of Ottawa’s talented modern artists ! Description: Students work on their own painting of their choice. Individual instruction is provided as painting is produced. 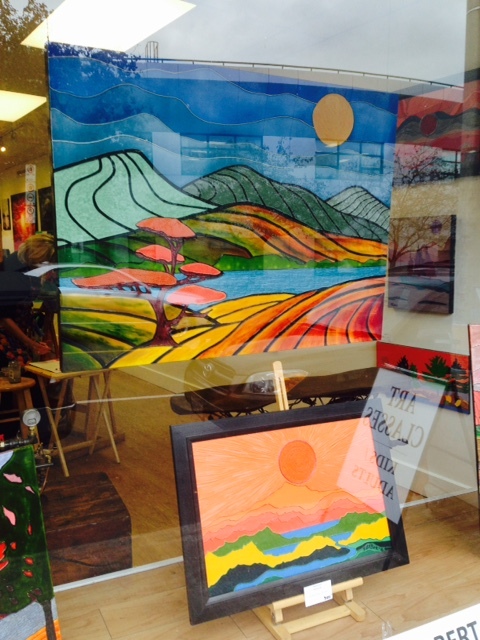 Artwork will be left to dry overnight on Thursday, and can be picked-up the following day. Fee: $95 Materials included. Students take home 3 finished pieces. Supplies required: Students are asked to bring materials for collage, such as photos, decorative paper, and/or small objects such as feathers, beads, or trinkets. All other materials will be provided. This workshop will open your eyes to new mixed media techniques, as well as introduce you to paints and mediums that are truly unique to Pébéo. 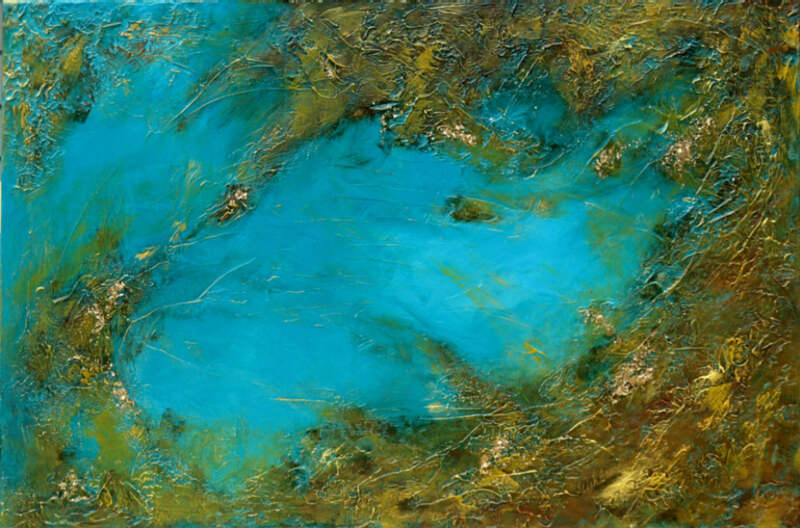 Pébéo’s Fantasy Paints, are oil-based alkyd colours* that self-manipulate to give a variety of effects, such as honeycomb, and hammered finishes. In this workshop, we will work with the entire Mixed Media by Pébéo program lines, including a variety of texture and effect mediums, and resins. 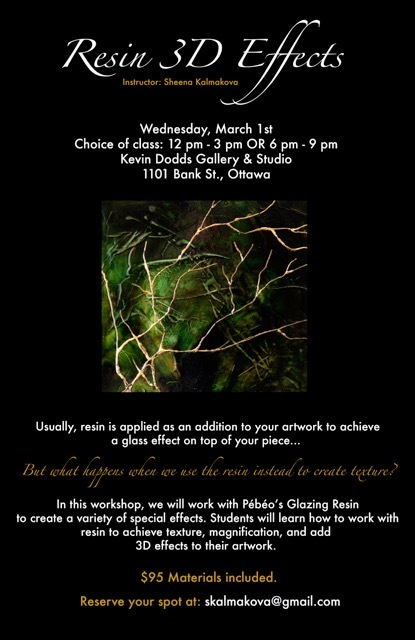 Interested in resins and adding the ‘glass look’ to your work, but not sure how to do it? 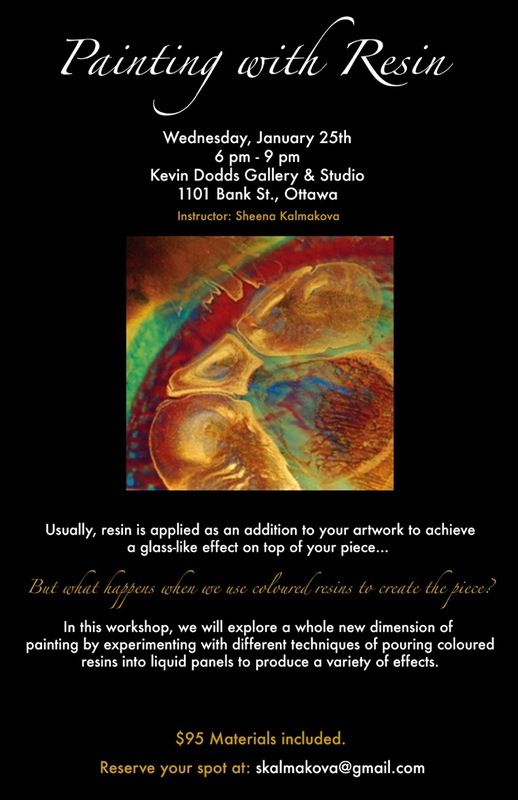 This workshop will demystify the process by introducing you to the different types of resin and their various applications, as well as show you techniques and tips for successful results. 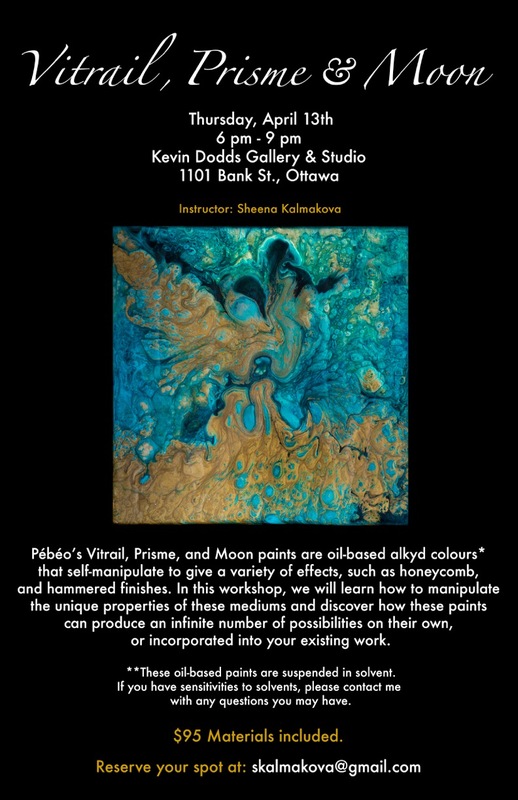 We will also explore the many effects possible by combining resins, other texture mediums, and the incredibly fascinating Moon, Prisme, and Vitrail paints. 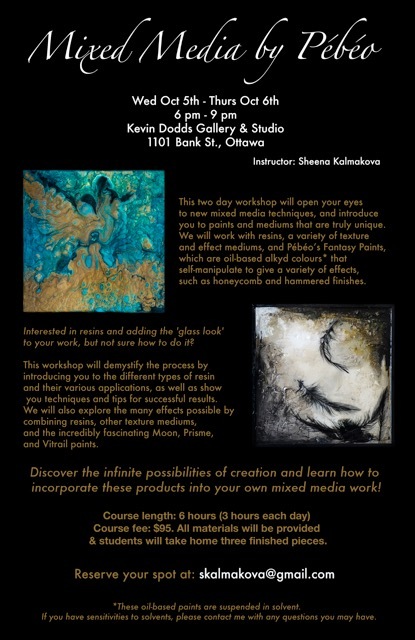 Discover the infinite possibilities of creation and learn how to incorporate these products into your own mixed media work. **These oil-based paints are suspended in solvent. 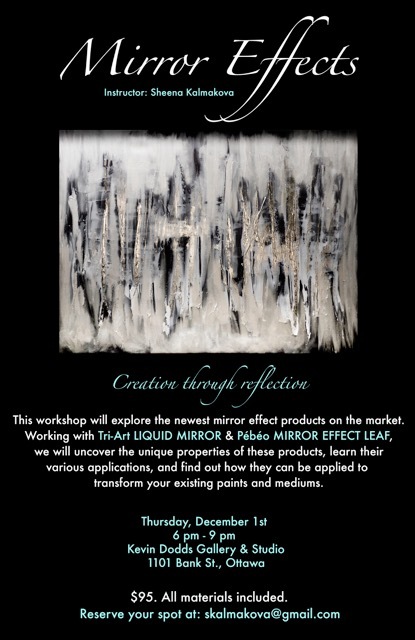 The class begins on Wednesday evening, with an introduction to the range of exciting products that Pébéo has available for mixed media artists. 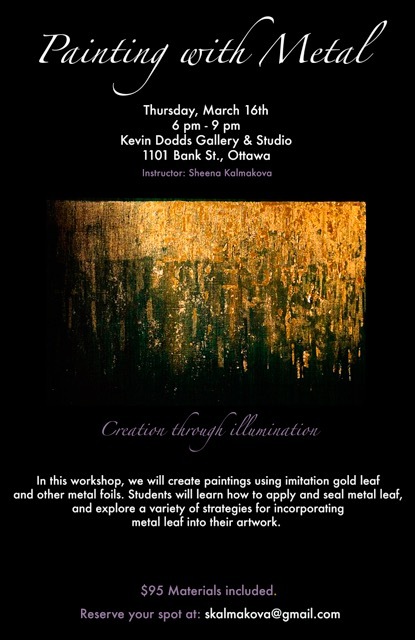 The attendees will prepare surfaces with acrylic paints, texture mediums, mirror effect leaf, and collage that will be left overnight to dry for the next day. On Thursday evening, we will explore the spectacular properties of the self-manipulating oil-based alkyd Fantasy Paints, relief-making resin, and the glass-effect of the pouring resin. Each attendee will finish with a set of three completed projects. Artwork will be left to dry overnight, and can be picked-up the following day. 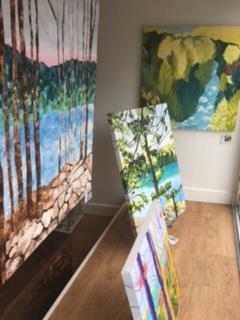 If artwork is too wet to take home, students can leave it at the gallery overnight to dry and pick it up the following day. Fee: $95. Materials included. Students take home 2 finished pieces. 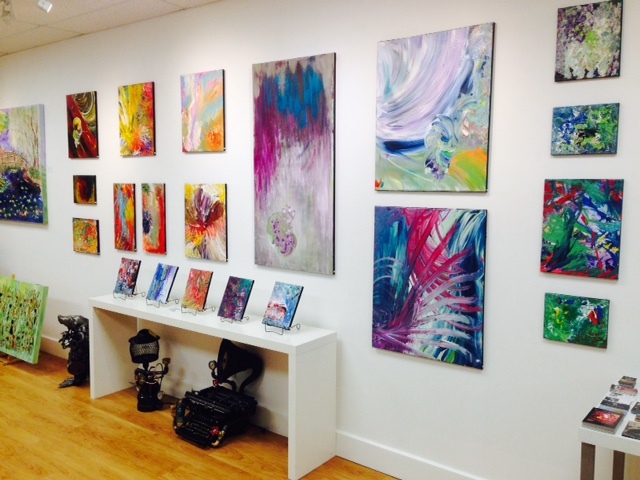 In this evening workshop, we will toss aside our paintbrushes and learn the art of paint pouring! Working with fluid acrylics and mediums, students will learn a variety of paint pouring techniques and also tricks to create different effects such as texture, layers and marbling. 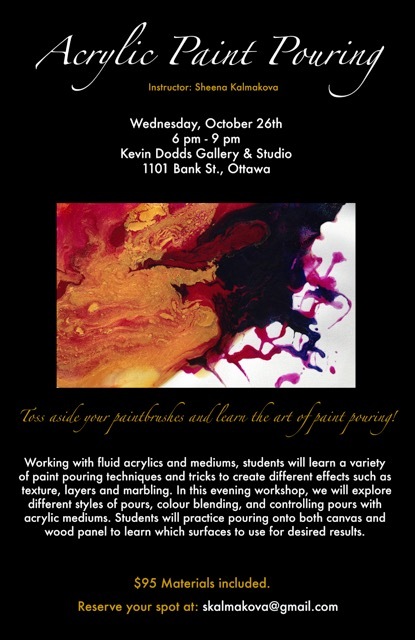 We will explore different styles of pours, colour blending, and controlling pours with acrylic mediums. 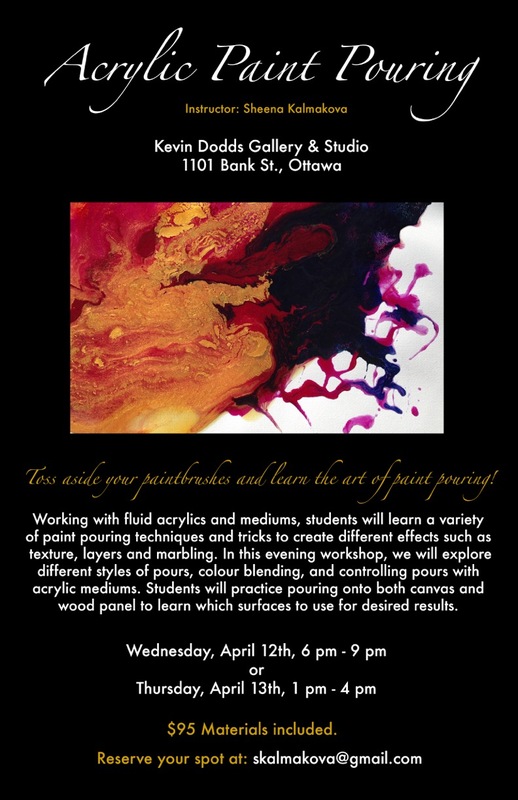 Students will practice pouring onto both canvas and wood panel to learn which surfaces to use for desired results. 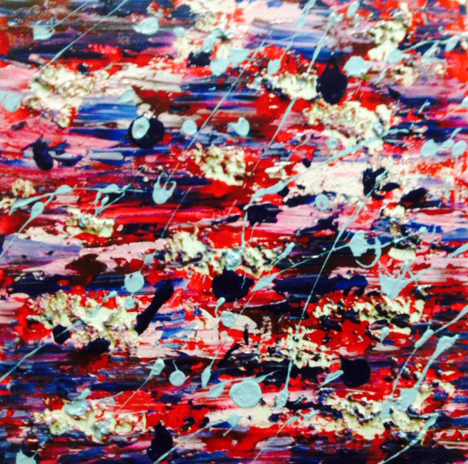 All materials will be provided to create two very different paint-poured abstract pieces. Artwork will be left to dry overnight, and can be picked-up the following day. Fee: $80. Most materials included. Students take home 3 finished pieces. This workshop is designed as a follow-up class to the Mixed Media by Pébéo Workshop. 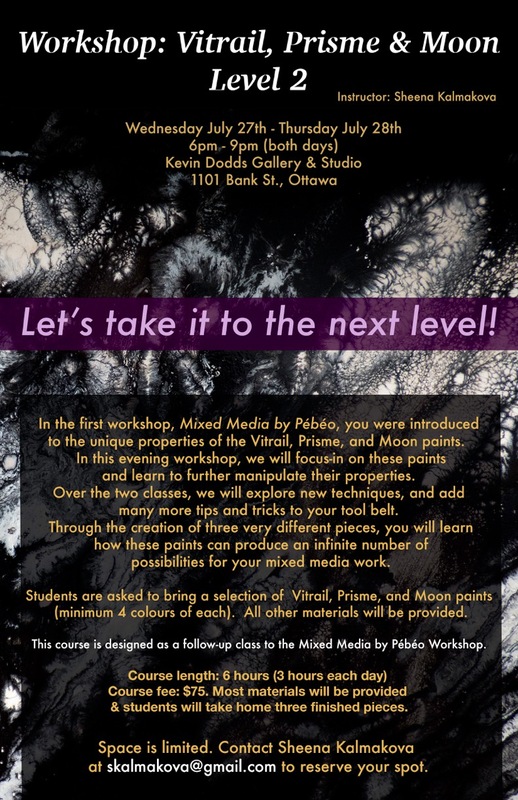 In the first workshop, Mixed Media by Pébéo, you were introduced to the unique properties of the Vitrail, Prisme, and Moon paints. In this evening workshop, we will focus-in on these paints and learn to further manipulate their properties. We will explore new techniques, and add many more tips and tricks to your tool belt. Through the creation of three very different pieces, you will learn how these paints can produce an infinite number of possibilities for your mixed media work. Students are asked to bring a selection of Vitrail (transparent not Opale), Prisme, and Moon paints (minimum 4 colours of each), and one bottle of Lightening Medium. All other materials will be provided. 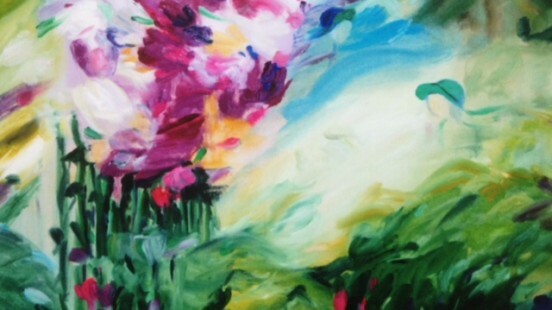 If you’ve always wanted to learn to paint then this course is for you! You will learn about the wonderfully versatile acrylic paint, ‘tools of the trade’ and a variety of painting techniques. 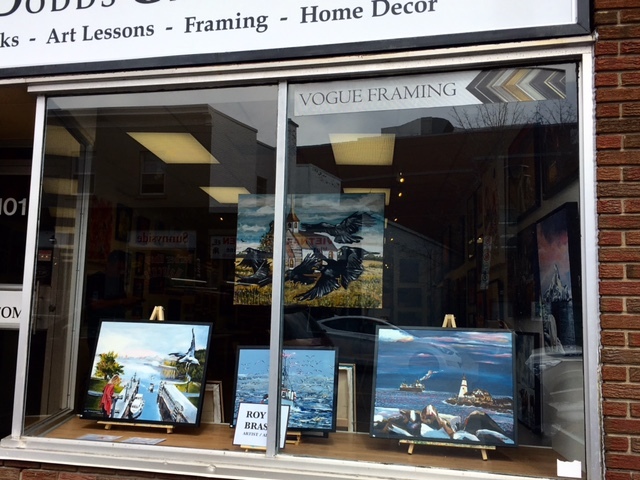 You will also learn how colour, value, composition and perspective can improve your paintings. Each week will consist of a brief lesson and then students will work on their own paintings with individual help. At the end of the course students will be able to mix colours, apply glazes, understand values, foundation composition and perspective. They will be comfortable starting and completing a painting on their own, and will complete several during the course of the program. A materials list will be provided at registration. For many of us colour mixing can be hit and miss at the best of times, but what if I could teach you, in a single workshop, how to mix the colour you want every time? Wouldn’t you want to know what I know that makes it so easy? You will by the end of this workshop! The workshop is based on the Split-Primary Colour Theory developed by Michael Wilcox and is suitable for all media where colour mixing is required. An extensive handout with exercises and notes is supplied so that you can refer back to it as you wish. So join me for some eye-opening fun with colour! A materials list will be provided at registration. Learn this Old Master’s technique applied in the modern day medium of acrylic paint. Glazing gives the artist complete control over colour mixing… allowing for richer, more subtle colours and greater suggestion of depth and distance in a more unified painting. Enhance your painting skills with the new techniques you learn in this workshop. Students will do a number of exercises as well as create a painting from their own resource material. This workshop is suitable for both beginners and more experienced artists. Workbook included. A materials list will be provided at registration. Scarves are an accessory that enhances your outfit by adding a finishing flourish and they are back in style this year! In this workshop you will learn how to create amazing scarves in the colours you want, to go with your outfits, or as gifts… just in time for Christmas! Each participant will create two scarves. Additional scarves are available for $7 each. You will be amazed with what you can create! All materials are supplied for this workshop, although each participant will be required to bring a microwavable baking dish or plate which will be used to create the scarf on and to set the dyes in a microwave. Finishing time for this workshop depends on whether attendees wish to do more scarves or not, so sometimes it runs longer or alternately sometimes runs less. We work until we are done! 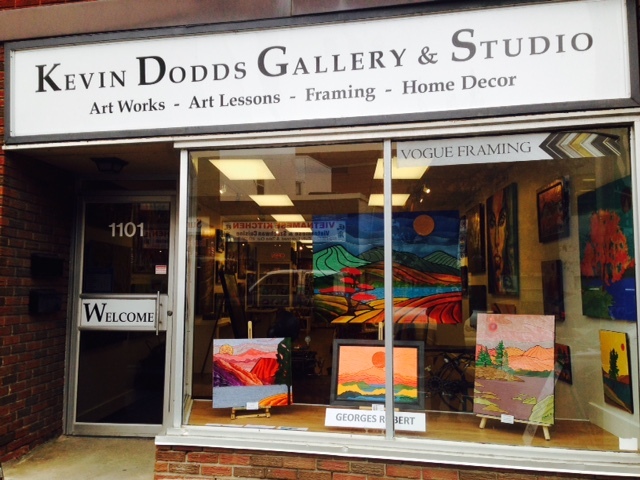 LOCATION: Kevin Dodds Gallery and Studio, 1101 Bank St.
Palette knife your way to a rainy-day cityscape. The painting will be on a 16 x 20 canvas in acrylic paints. This class will be a fun way to learn to use a palette knife, brushes and easel to create a beautiful painting you can hang in your home. Painting class using oil paints and oil medium. The use of various colours and colour mixing will be explored. 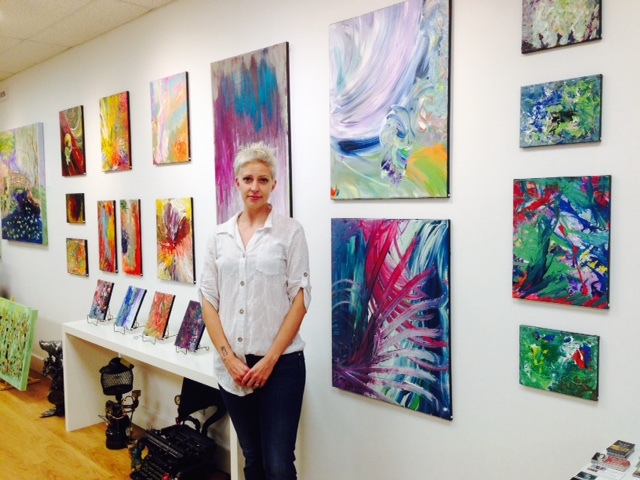 Participants will use brushes and possibly palette knives. 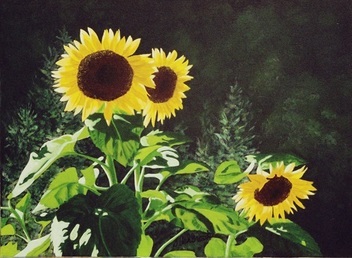 One painting, similar to the attached photo, will be produced in this 5 hour class. 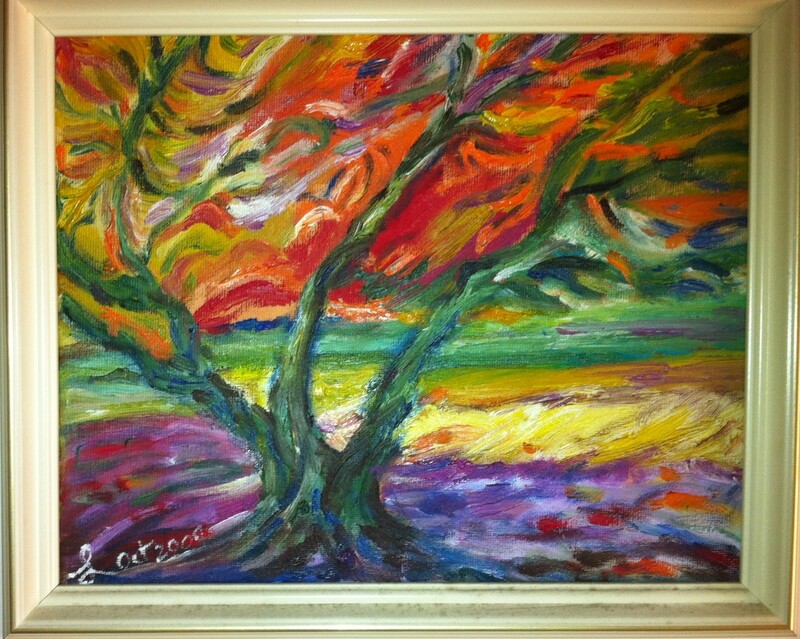 Description: Acrylic Impressionistic Landscape Class with figure. It will be similar to the photo above. 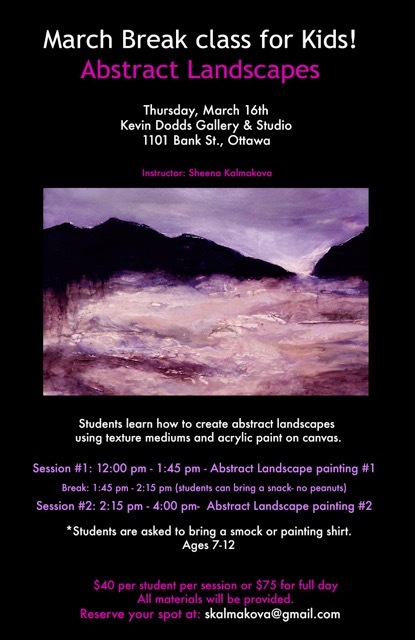 One painting will be produced in this 5 hour class using brushes and palette knives. 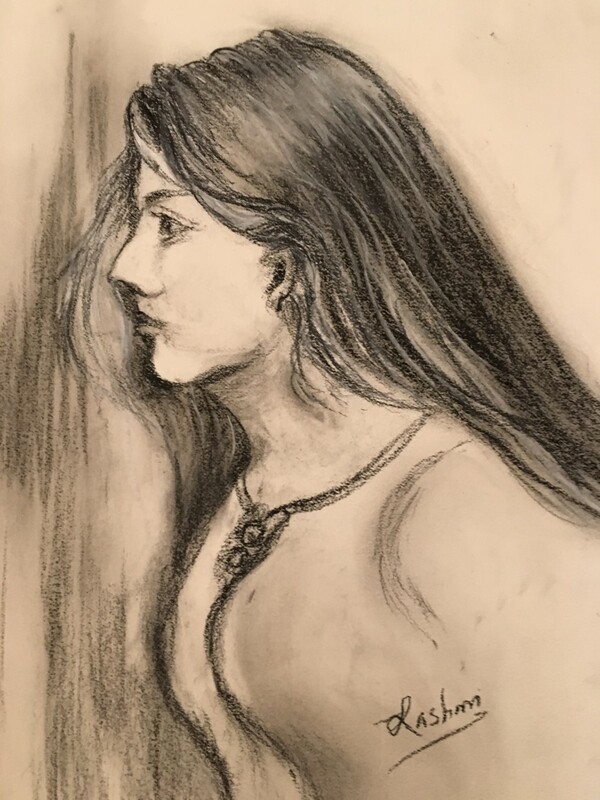 This will be a special drawing class using, charcoal, conte chalk, pencils, etc. We will be working with a live model . Students will be given large sheets of paper where we will do quick sketches leading up to a more detailed drawing on watercolour type paper. We will look at folds in material, face and body structure, the effects of light on the figure etc. Some portrait work may also be looked at. Students don’t need to have a lot of previous drawing skills. It will be a great class!!! This will be a really fun class! Learn how to use fairly new acrylic products on the market such as Pouring Medium and the very thin and fluid “High Flo” paints. It will explore ways of using the new high flo acrylics as well as other types of acrylics in conjunction with various acrylic mediums, but especially the pouring medium. 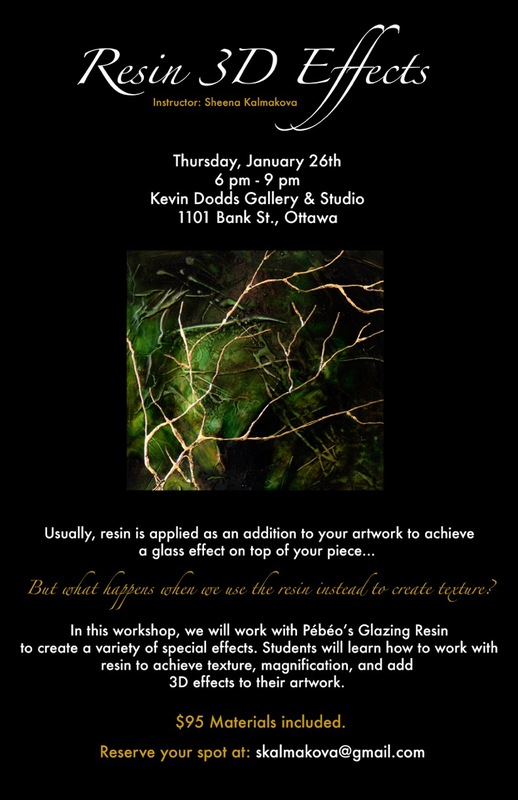 Students will learn how to create different effects in the pouring medium and will produce up to a couple of contemporary looking paintings. All materials will be provided and two instructors will ensure a lot of personal attention. 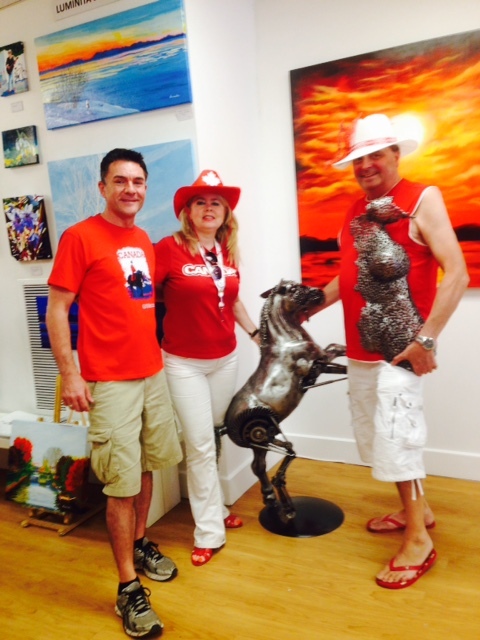 Kevin and two famous former figure skaters from the Ice Capades, Ellen McLean and Stephan Klovan, wish you a Happy Canada Day from the Kevin Dodds Gallery at 1101 Bank St.
Fee: $40 All materials will be provided. Students will take home 2 finished pieces. 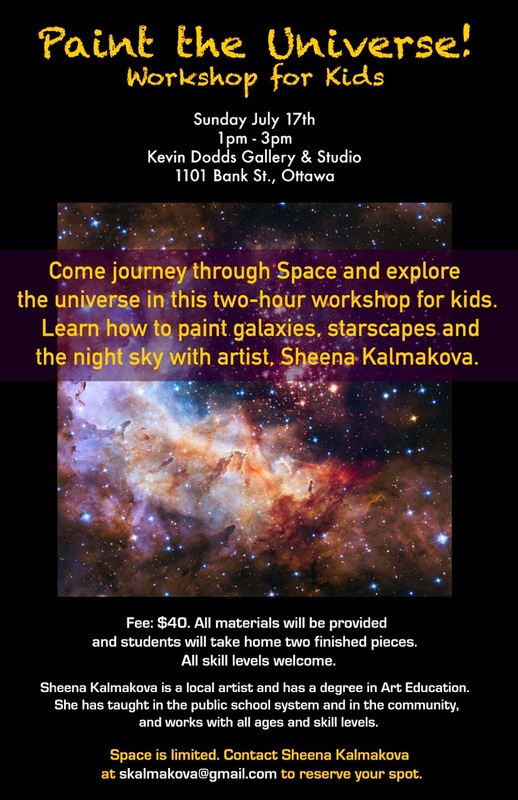 starscapes and the night sky with artist, Sheena Kalmakova. All skill levels welcome. the community, and works with all ages and skill levels. Space is limited, so please email Sheena at skalmakova@gmail.com to reserve your spot. Fee: $75. Most materials included. Students take home 3 finished pieces. of possibilities for your mixed media work. Fee: $95 All materials will be provided. Students will take home 3 finished pieces. This workshop is perfect for beginners and for those who have experience in mixed media and are curious about the Pébéo line of products. Pébéo’s Fantasy Paints, are oil-based alkyd colours* that self-manipulate to give a variety of effects, such as honeycomb and hammered finishes. 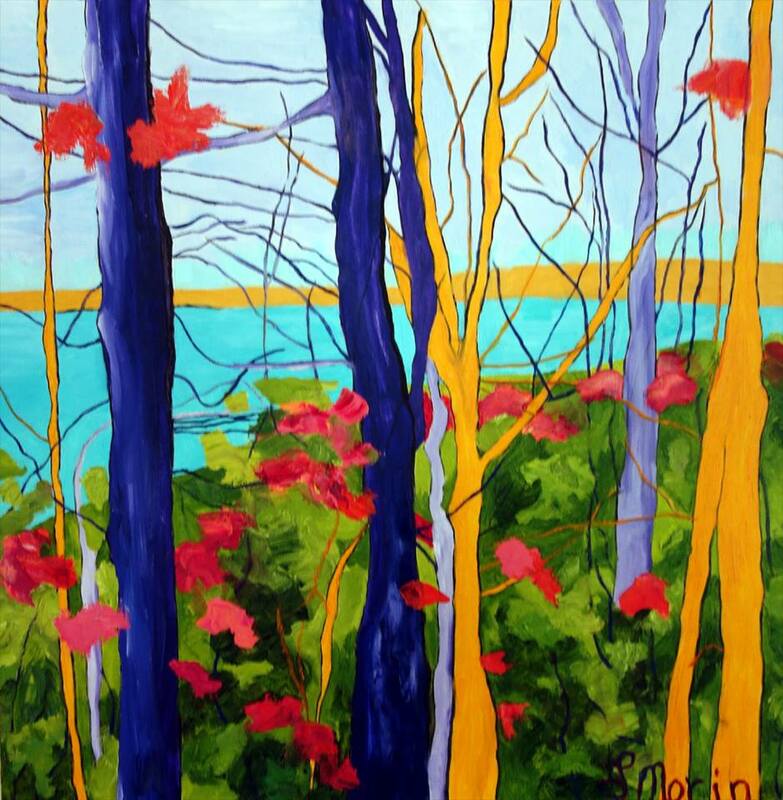 In this workshop, we will work with the entire Mixed Media by Pébéo program lines, including a variety of texture and effect mediums, and resins. to the different types of resin and their various applications, as well as show you techniques and tips for successful results. We will also explore the many effects possible by combining resins, other texture mediums, and the incredibly fascinating Moon, Prisme, and Vitrail paints. Discover the infinite possibilities of creation and learn how to incorporate these products into your own mixed mediawork. collage that will be left overnight to dry for the next day. 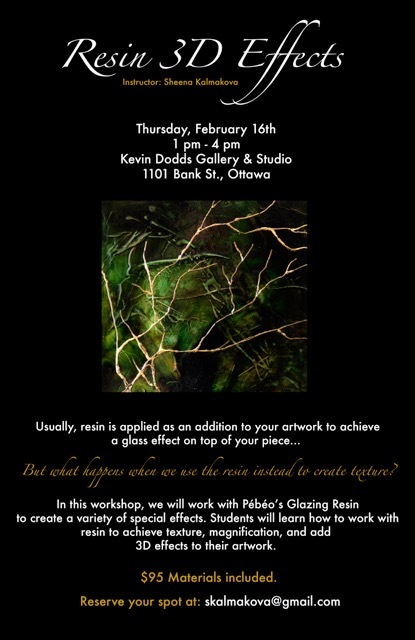 resin, and the glass-effect of the pouring resin. Each attendee will finish with a set of three completed projects. Puppet making class for children or adults, or even for parent and child together ( cost for 1 student only). Each student will produce one or two puppets. This will be a really fun class! It will cover techniques in creating a dynamic abstract painting. 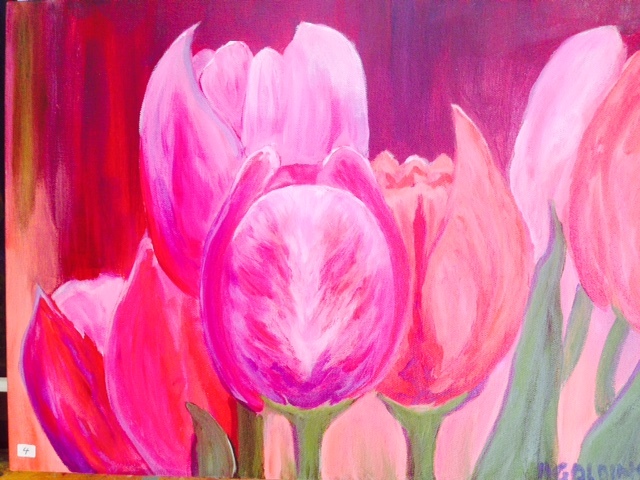 Artists will paint on a deep 18″x 24″ gallery wrapped canvas. 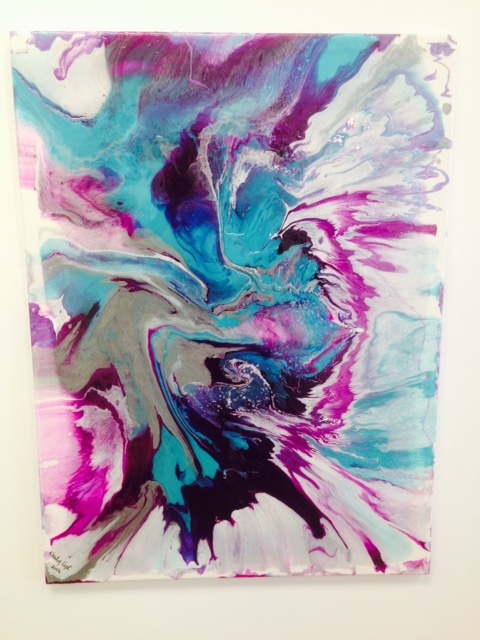 We will use an array of acrylic mediums and colours to create a completed abstract painting. Cost is based on the material costs to create your masterpieces. Bring some brushes if you can. 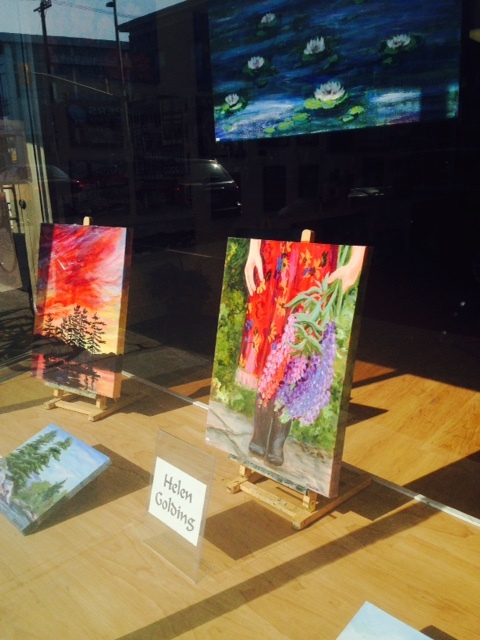 Come and view these incredibly beautiful paintings by Helen Golding. 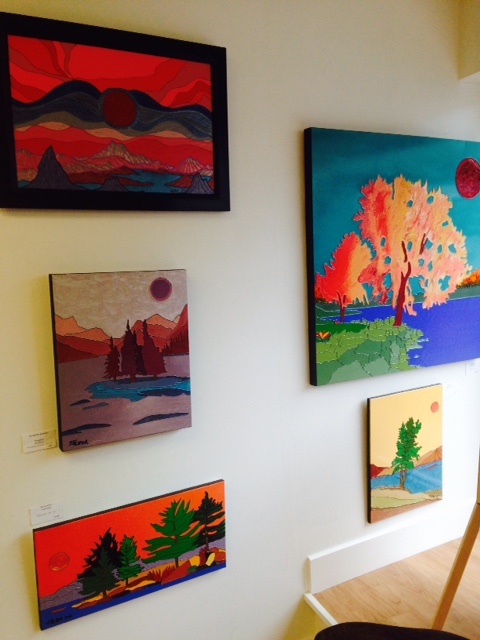 For info, contact the gallery at 613-695-6900. 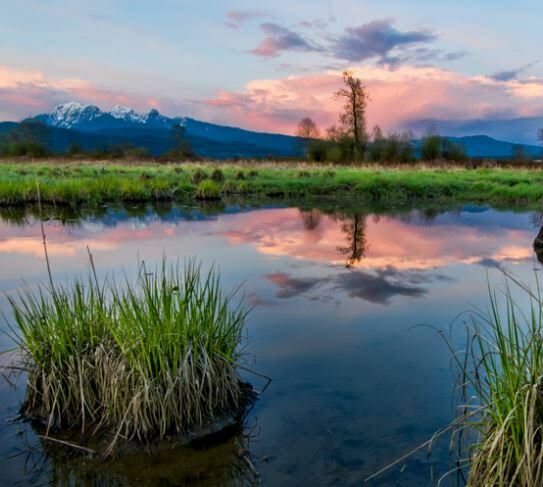 Description: Learn Kevin Dodds’ techniques to paint water and its various aspects: reflections, ripples, small waves. Cost: $125 + HST – includes all supplies except brushes:canvas, acrylic paints, medium. 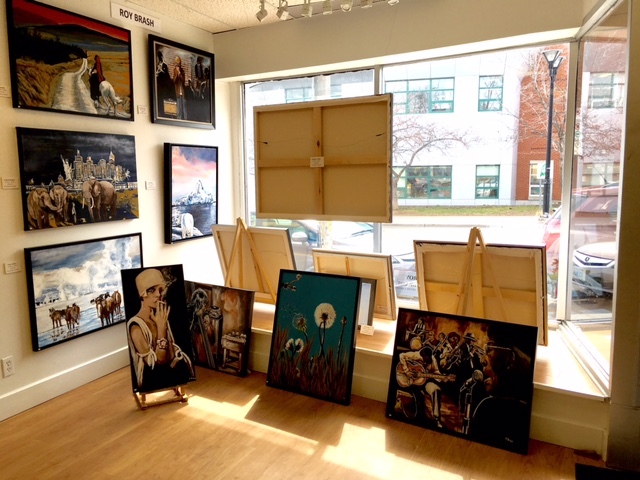 The Kevin Dodds Gallery is very pleased to announce the two week special art show by Roy Brash, a Canadian contemporary visual artist. 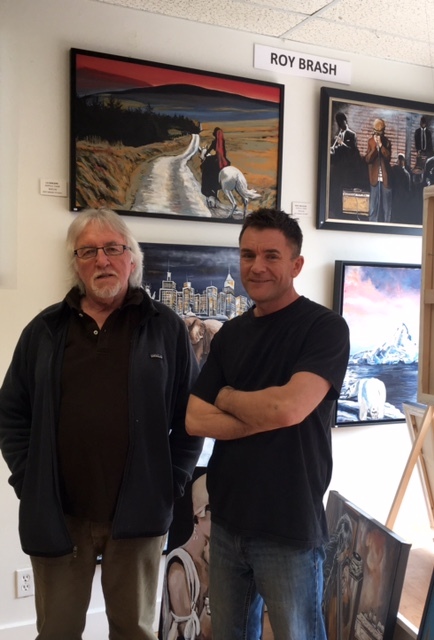 A native of Pembroke, Ontario, he now resides in Ottawa where he has a studio. 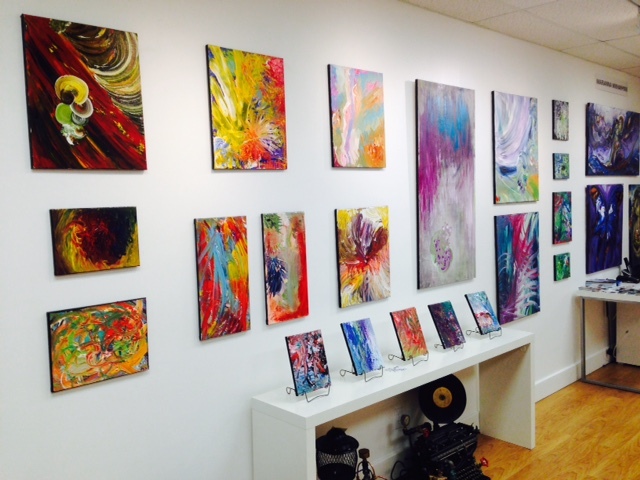 Here are some photos to give you an idea of the beauty and the breadth of Roy’s art. 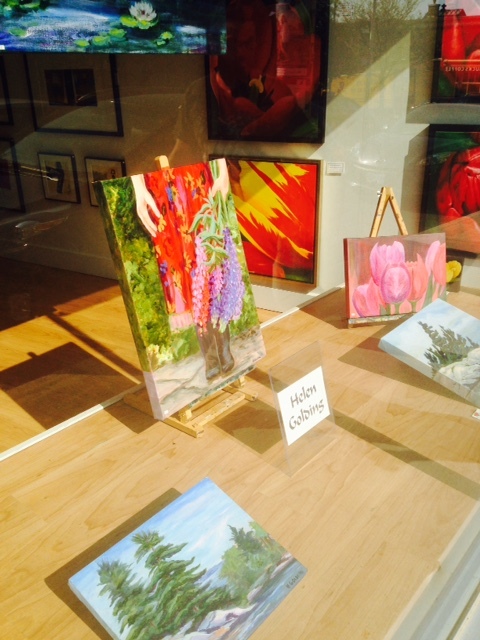 You can view Roy’s work at the Kevin Dodds Gallery, 1101 Bank St. every day between now and May 2, from 11 am to 6 pm . 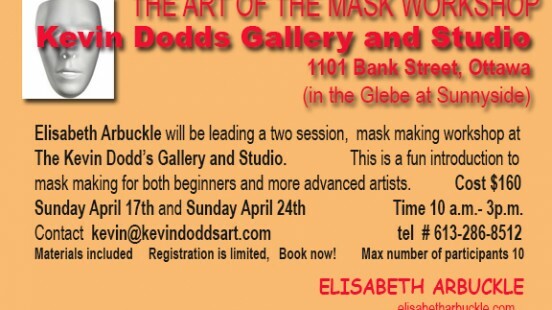 This workshop presents a brief history of mask making and the practical building of a plaster mask. The objective is to introduce a new medium, to plan, prepare and complete a final finished decorative mask. Maximum number of participants 10. 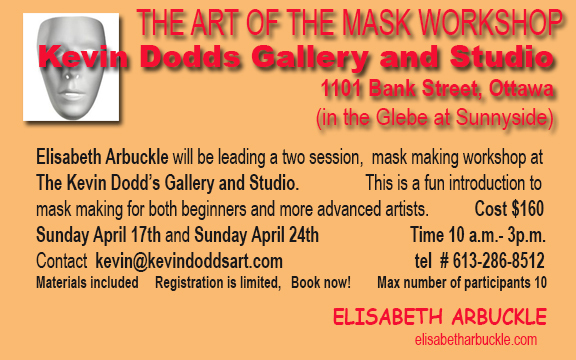 This is an introductory mask making class for beginners and/or more advanced artists. Session One: Intro, demonstration, planning, prepping and making the mask. Exploring ideas and materials for development of the mask. Materials: Plaster strip, scissors, water containers. 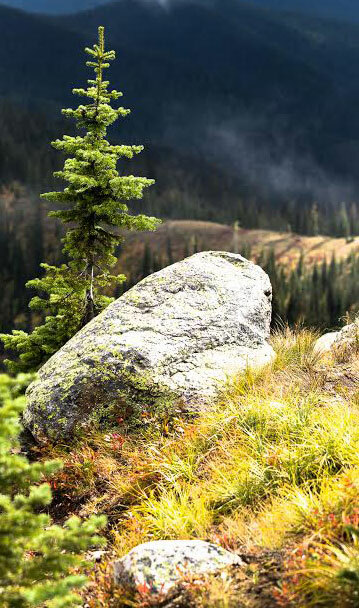 Painting Elements of Nature- rocks, trees, grass etc. 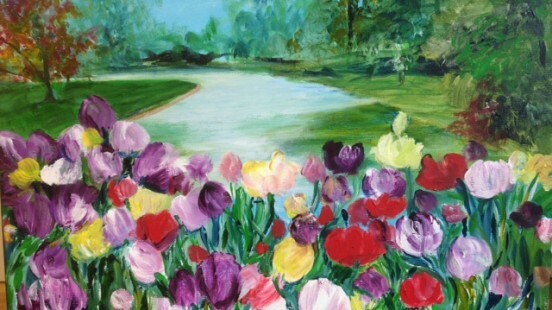 Take your landscape paintings to a higher level! Cost: $100 + HST– All supplies except brushes will be supplied: 2 canvases, oil paint ( or acrylic if you prefer, but mention this when you register). 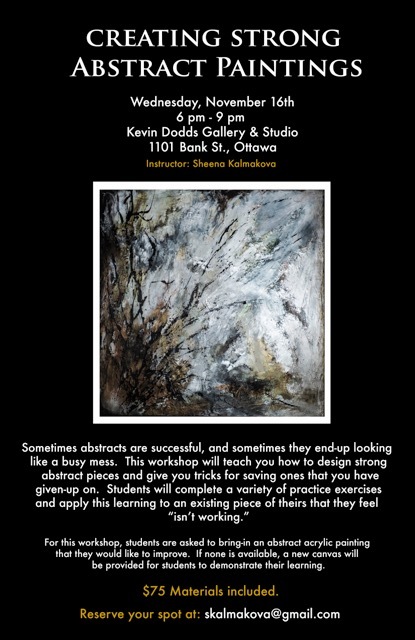 This is a one day workshop with internationally known artist Kevin Dodds. 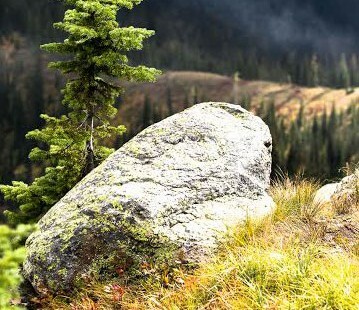 It will cover how to paint birch trees, pine trees, textured rocks, grass and even weathered barn wood. Kevin will be working in oil, but you can use acrylics if you prefer. 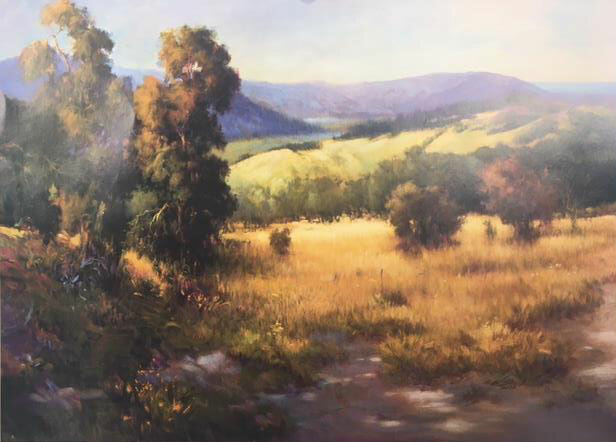 Participants will be provided with two canvases and instead of rushing to complete one full painting, the class will produce several vignettes in order to really concentrate on how to paint these various natural elements. This is a one day workshop with well-known Ottawa painters Rashmi Rekha and Kevin Dodds. 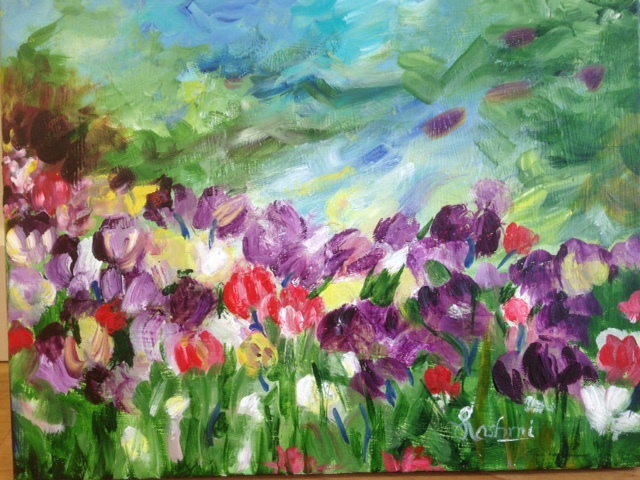 – Learn how to paint an impressionistic tulip painting with or without a background, creating beautiful colourful loose effects in acrylic paint. 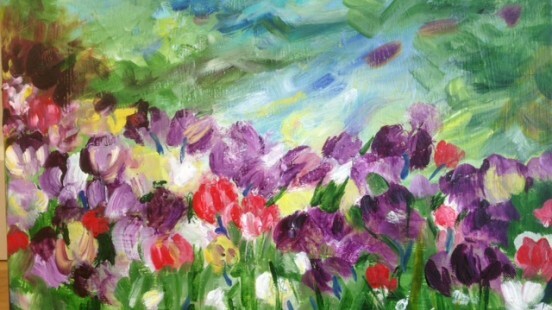 Learn to express yourself freely with impressionism. 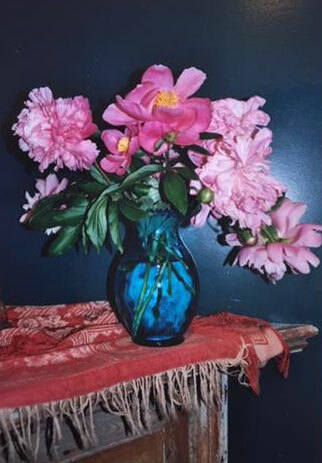 Learn how a ‘cacophony’ of colour, carefully balanced, gives excitement and originality. 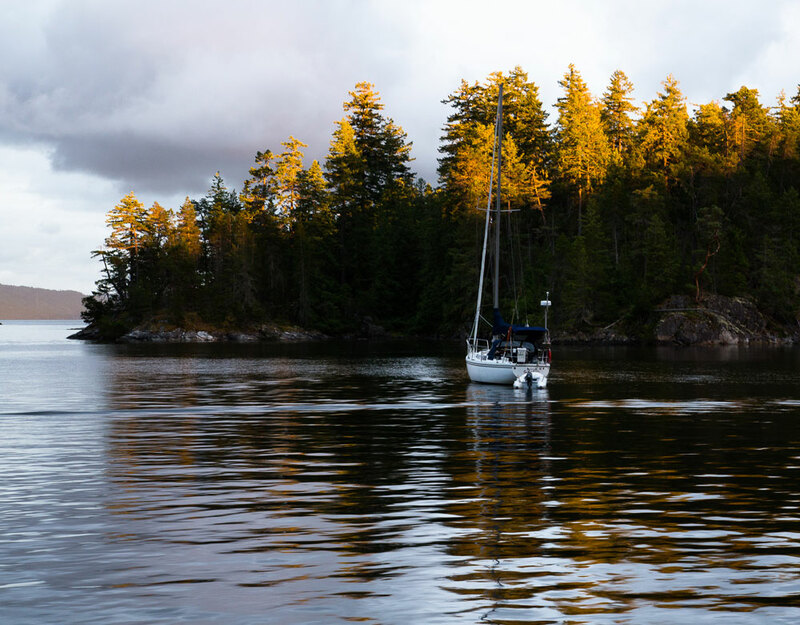 It’s not about creating ‘real’ but being adventurous in your form. You can choose your level as per the photos: very loose, more details and a little background,, a much more detailed background. 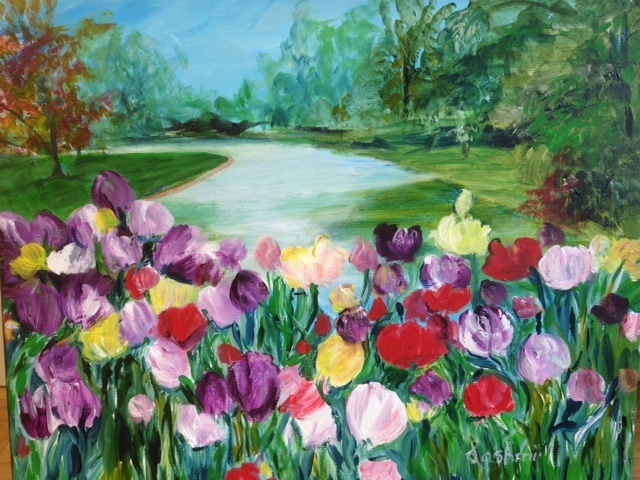 Just in time for springtime, paint colourful tulips along the Rideau Canal.